Pat the Dog speaks with playwright Evan Tsitsias about his recent production, Aftershock. 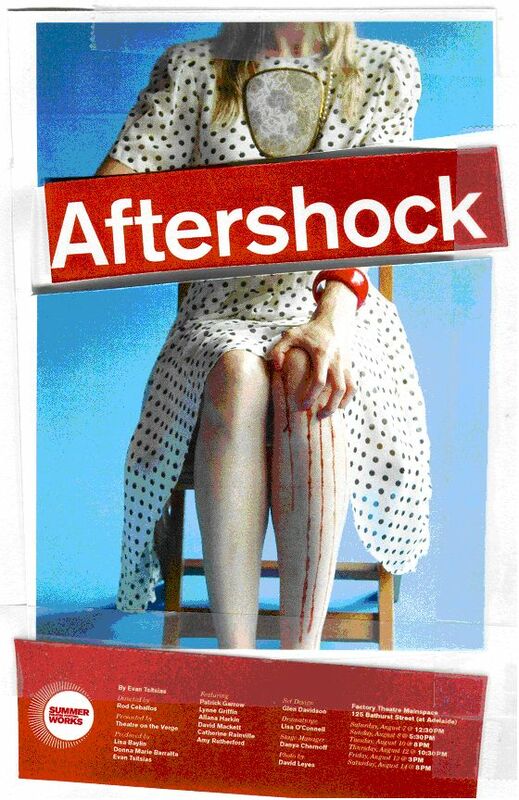 Aftershock was originally written in 2009 as part of Pat the Dog’s 24 hour Playwriting Contest with the IMPACT festival where it placed 3rd. He then worked with Lisa O’Connell on developing the script with the hopes of entering it into SummerWorks. It was also part of Magnetic North’s piece/meal series before it premiered at SummerWorks. Synopsis: Anna has just returned from one of those “Extreme Makeover” shows on television. She returns to the trailer she lives in with her eccentric family who are all shocked at her transformation and not sure how to communicate with her now. This makeover ignites a sea of change in everyone around her, except for Anna, who doesn’t know what to do with her new and improved self. She finds she has to take some desperate measures to get herself to finally move, in any direction. This was your first stage production. What did you learn during SummerWorks? I don’t think there is enough cyberspace to tell you how much I learned from this experience. The most valuable lesson I learned is the art of true collaboration. You truly are only as good as your collaborators. I also learned to put my ego aside for the benefit of the piece. I learned patience…a lot of it! I learned to keep an open mind and spirit and not treat my words preciously or as sacred text. I learned to take risks and trust that process is more important than product. I learned not to analyze the tone in which people ask you questions about your script. I learned how vulnerable it makes you when people speak your words out loud. And that was just the first day of rehearsal!! What did you wish you had known going in? Basically I wish I had known everything from the first question above. I had no idea how much work it was going to be which I think is actually better. I have produced many shows in the past but for some reason this one was the most challenging of all. Probably because I was so close to it. How has the process of getting a play produced at SummerWorks affected your voice as a playwright? The festival itself was an amazing experience. The audiences and the word of mouth was incredible and the atmosphere is charged with creativity and nurturing and fun. It gave me confidence that I can follow this path and not be frightened of my voice, whatever the response to the work may be. It definitely showed me I can take a risk and have it pay off. I’m not sure if it directly shaped or affected my voice but it definitely shaped my perception of playwriting. The audiences were incredible. This festival thrives on word of mouth and the audiences are on the hunt for good work. They really changed drastically night to night, as did the show. Some were very vocal, some were very intense and focused, and some were a mixture of both. Still not sure which one I liked best. It was interesting for me to watch each show and see what the audience responded to every night, whether it was in the same moments or different ones and trying to figure out why they responded to those moments that particular way. One constant in each show was the audible gasps every time the character began to mutilate herself. It was a thrill to hear such vocal responses. Felt like they were right there, along for the ride. Did the audience reaction change how you felt about your play? If so, how? It didn’t change the way I felt about the play itself, but it did change the way I approached my rewrites. It was such a valuable experience to treat the Festival as a preview of what the show would become and evolve into. I think that is my favourite aspect of Summerworks. A chance to experiment in an environment that is geared towards process. Aftershock got a lot of reviews. Were the reviews positive or negative and how did they affect you? I would say almost every review was extremely positive. I still find it a little strange to be reviewed on a new work that is only one hour long, truncated due to the time limits of the festival. I approached this process as a “workshop” or a chance to preview the show with an audience. My first viewing of the show in full with tech etc. was in front of the opening day audience, so it was a surprise for me as well. It’s daunting when you think of reviewers critiquing your piece when you know it’s in stage one of its development process. So I had to prepare for whatever the reviews said. I knew there were holes in the script because of the time constraints and so I took them all with a grain of salt. I’ve developed a very thick skin through this process. I’m just grateful that the reviews were so positive! There was, of course, one review that put a negative spin on the exact things I was aiming for. It was my favourite review because I felt like I accomplished exactly what I wanted, even though the reviewer disagreed with my intention. I do take a little nugget from each review that has helped in the rewrites. I wish we lived in a world where reviews didn’t matter but they absolutely do. Not to my inner world, but to the outside world, unfortunately they can dictate the future of the piece. Self-producing as a playwright — good or bad? Please explain. It was both sides of the coin. On one hand, it was great to have more creative control over the process and try to bring as much of my voice into the experience as I could. I was able to choose props, set, creative team etc., which allowed me to feel more comfortable. But on the other side, it was difficult to split my focus as a playwright. I couldn’t sit there and just listen to the words because I’d be thinking about props, costumes, set, publicity and a million other things that I knew needed just as much attention. I had two amazing co-producers that took a huge load off my shoulders so I would definitely suggest that playwrights/producers collaborate with another producer to take over once rehearsals begin. Yes I would absolutely do it again and can’t wait for the next phase of this process. In hindsight, I would have given myself more rehearsal time. With a new piece, there were so many questions and rewriting during rehearsals. It would have been nice to take more time to explore the world of the play. I would also have my dramaturg with me for more or all of the rehearsal process. I realized how important they are to the process of producing new work. I’ve already begun working on rewrites for Aftershock. I started them the day after the festival was over. I was so inspired after watching it in front of an audience that I needed to expand and fix and edit the whole thing. Immediately!! I’m also working on a brand new script. One of my other plays, Unstuck, is also being produced as part of the Foundry Theatre’s 2010-11 season so I will also begin working with a dramaturg and director on that piece. I am also initiating a Canadian version of the Lincoln Center Theater Director’s Lab which I’ve attended the last two years in New York. It’s a very exciting project and one that I hope continues to grow year after year. I am working with two other Canadian Lincoln Lab Alum members to create it. So my plate is pretty full and I couldn’t be happier!